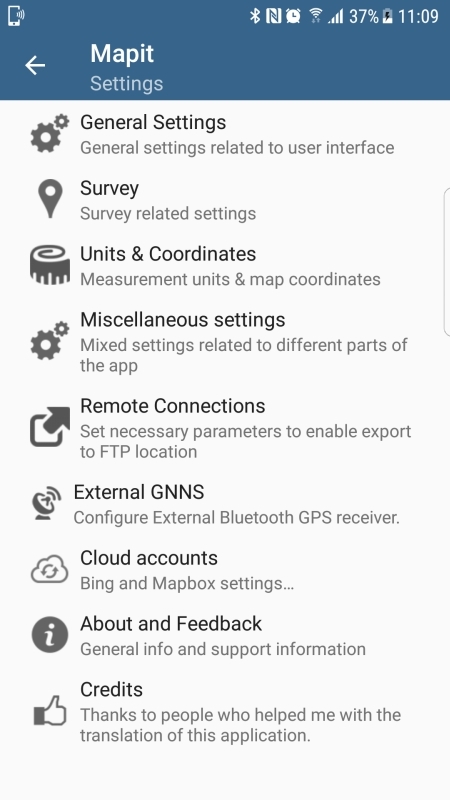 MapIt is a form of mobile GIS app designed to support GPS data collection and any kind of GPS or location based surveys. It’s a mobile GIS tool addressed to land and field surveyors or anyone else dealing with environmental and spatial data. MapIt makes GIS data collection or field survey process faster and more efficient. App also can be used as a tool for quick measurement and to calculate areas or distances. When registering location simply choose required attributes from pre-defined drop-down list. There is no need to type the same information over and over again. You can import long list of attributes from text files and re-use them in number of projects. If necessary you can add one or more pictures to each location as well. If you are working in the field, gathering large amount of spatial (location) based data MapIt app is designed for you, so just give it a try. It’s difficult to provide description of all MapIt functions in a short form however number of basic activities and functions have been described in separate articles. Below you can find compacted kind of user guide with links to other articles when applicable. This user guide is a working progress and more information will be added in near future. We highly recommend that you follow as well our ‘Walk-through‘ page before you start using the app. Navigation drawer – The navigation drawer slides in from the left and allows navigation between major modules of the application. Map centre – cross-hair cursor or location symbol depending if ‘Centre on GPS’ status. Measurement tool – this tool can be activated to quickly check the distance on the map. When the tool is active features will not be saved to the layer and the measurement results will be only visible until the tool is de-activated. Measurement tool have got two states (distance/area) – they can be swapped by long press action. Add Point/Vertex tool – depending from the app mode this button can be used to add vertexes for measurements or add points to the point layer. To be able to add/gather data you need to set an active layer. The active layer is always displayed in Location 5 of the picture above. Depending what kind of data you need to register the active layer geometry can be type of POINT, LINE or POLYGON. The icon on the status bar will be changed depending what geometry type is being set for an active layer. Before registering the data please make sure you have ‘Quick Measurement Tool’ switched off, otherwise ‘Add Point’ button will add only measurements vertexes. Navigation Drawer->Manage layers->Select layer from the list-> press the ‘check’ icon on the toolbar. Navigation Drawer->Manage layers->Select layer from the list->Edit Layer->Check the ‘Active Layer’ check box and Save. Number of projects require that you register number of properties like gender, colour, height etc. for each location. The common pattern is that these properties can be the same for number of locations – the attribute set used with your layer is going to speed up this process as instead of typing the same information over and over again you will simply pick the necessary values from the drop-down lists.